Hi, Sorry if this post is irrelevant to letterpress. I got a 1957 spirit duplicator for 5 bucks. I want to try printing with it. I am planning to get some duplicating papers or some drawing ink/pen from tattoo supplies. For duplicating liquid, I am wondering If I could use something alternative like high proof Voka. A bottole of isopropyl alcohol from car supply could be a cheap option. I am not sure what alcohol will work or not as I don’t have duplicating papers or ink. I seem to recall that the fluid for these was methyl alcohol. 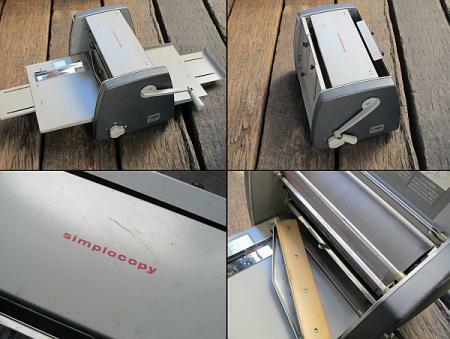 I have one of these I used to use as intended, but have used it most recently to dampen card stock prior to letterpress printing. Just use water in the fountain. It worked reasonably well, but I found I had to run through twice to get enough dampness with the stock I was using. I never thought of using the machine for dampening cards. The shop my brothers and I own was originally part of the Bell + Howell in-plant shop. We purchased the shop from 2 men who worked for Bell + Howell. One ran the pressroom, and the other the offices for the in-plant. The man who ran the pressroom we kept on for a few years to help train us on the letterpresses. We had 2 Miehle Verticals and 2 Ditto 15. The Ditto 15’s were actually Chief 15 that ATF licensed the name to Bell + Howell. Spent a lot of time learning to do make-readies on the Miehles to run the hecto masters. I do remember the Ditto fluid being mostly alcohol. I am searching transfer Paper/ Hectograph paper on ebay or ali…e.p..ss. But I don’t know which one to buy as I am confused about how those transfer paper work. I understand there are thermal type and non-thermal. If anyone has knowlege about those master paper, please tell me about and direct me to a right products. Since I don know how those transfer papers layers are constructed, I am wondering how tranfer papers produce a millor/reverse image. Do those transfer paper produce a millor image by tracing an artwork or typewiting? I can imagin it depends on whchways the face of carbon layer is facing. Or If am wrong, Do I have to trace on initially reversed image? With drawing/tracing illustrations by hand, I want make a master which its image is facing outword the cylinder of my duplicator. For tracing artwork by hand or typewrite, do I need a non-thermal Hectograph Transfer Paper? The hectomaster we used to purchase had a tissue paper inside the hinged form. If you wanted to use the hectomaster as a printing master you would remove the tissue & crash print the form so the carbon made a solid transfer to the back of the white sheet. The white sheet was used as a master to print from the ditto machine. That is why the white sheet was “wrong reading”. I looked up the formula used with ditto machines and found that a 50-50 combination of wood grain alcohol, from like Home Depot, and isopropyl alcohol works best. However it is extreamly dangerous, one because its highly flamable. And two because the vapors can be leathal. They now make and sell gallons of ditto fluid which is neither flamable or toxic. Although some what pricy. I saw a project of this artist on Pinterest. I am very curious what his “alternative, nontoxic duplicating fluid” is. I tried to run my duplicator. I mixed methaonl / isopropyl alcohol. The mixing ratio is 50/50. However, the image came out too weak. The master I used, was a sample image from a supplier of a tatoo transfer paper. The master was thermal-copied and not used before. So I guess, the problem is the fluid or the machine. Maybe I didn’t put enough the fluid. If anyone knows how to get a good printed image with a ditto machine/spirit duplicator, please share your thoughts and help me out. How does your image compare to the image on the hecto master? our ditto machine. It was like 20# bond but had a very smooth surface. I used one of those master which Tattoo industry use. The attatched image is the compared the printed and the master. I’m not familiar with tattoo masters. The carbon on the hinged hecto master was very thick, it was much heavier than standard carbon paper. The carbon would transfer to your hands when you jogged the forms from the edges. Where can I get the hinged hecto master? http://tinyurl.com/kv4lrta when I sold office supplies. In case the url doesn’t work it’s Repeat-O-Type Mfg. Corp. I assumed those master that Tattoo industry use would work. May be It would not.. I don’t know. This is my followup of Spirit duplicator project. I used a thermal copier and ReproFx thermal papaer to make a master.The result is terrible as you can see the photo attached. The master i used does not work for the duplicator. I just thought it would be interesting to print with Ditto machine. I think I should let this project go and stick to my letterpress project. It may be a good idea to use my duplicator fordampening cards for letterpress or blockprinting. Actually, your image looks par for the course from what I remember of “dittos” in elementary school. Generally the best image reproduction was from a typed master. Solid art was blotchy and line art had to have a fairly solid (2 pt) stroke. The paper seemed to be more calendared/smooth finish than modern copy paper—but not gloss smooth like a modern thermal printer paper.. I think this is a technique that can produce interesting “effects” printing, that can be used in conjunction with letterpress, but except for nostalgia, is probably limited as a sole printing medium. The paper my teachers used for BandA* printing (Ditto didn’t/doesn’t exist in the UK) was a very smooth stock, and quite thin. The images were sharp and very distinct. Our history teacher would draw maps by hand and type the text on a standard manual typewriter, using multiple coloured carbons. For a map of the western front (WW1) he’d show the German lines in purple, British in green etc. They were a thing of beauty - he was very inventive with this primitive technology. The examples above don’t show Banda (or Ditto) at its best. If I can be helpful to anyone please contact me. Thru Ebay, YouTube or here at Briar Press.